If you weren’t already a big fan of quadrotors by this point, we’re pretty sure the video below will get you on the bandwagon in no time flat. The video was debuted this past week at the TED2012 conference, giving [Daniel Mellinger, Alex Kushleyev, and Vijay Kumar] from the University of Pennsylvania GRASP Lab, a chance to show off their amazing robotics work. 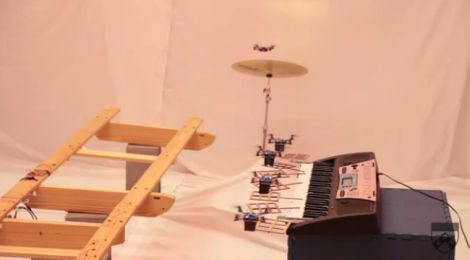 The team used a set of autonomous quadrotors to play the [James Bond] theme, complete with keyboard, drums, cymbals, guitar, and maracas. The coordination of the robots undoubtedly took an incredible amount of time to orchestrate, but after watching the video we think it is well worth the effort. Now of course you can’t simply input a piece of sheet music into the quadrotor control system and expect them to play it, but we imagine that time will arrive before you know it! Continue reading to see the [James Bond] theme song in full, and be sure to swing by the U Penn site to read more about the project.